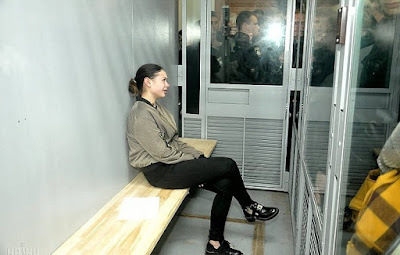 The Ukrainian heiress who killed five and injured six in a horror crash was yesterday detained for two months to stop her fleeing the country before her trial. 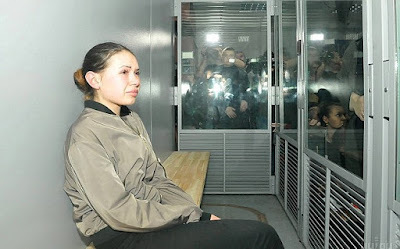 Alyona Zaitseva, 20, burst into tears as she was detained despite an extraordinary appeal to allow her multi-millionaire father to compensate her victims and their families. Shocking video footage shows the sickening moment her Lexus ploughed into a crowd after she drove through a red light and hit another vehicle at 63mph in central Kharkiv. 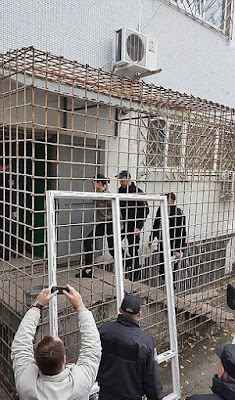 The glamorous oligarch's daughter was seen in tears alone in the courtroom cage at the start of a legal process which could see her jailed for a maximum ten years after a crash which left a street in the Ukrainian city looking like a 'war zone' with bodies strewn on a pavement. In an extraordinary message from the dock to the bereaved and injured, the weeping heiress said: 'I am sorry that this situation happened and people suffered. Her lawyer Yulia Kozyr - famous for representing prominent people accused of corruption in Kharkiv - had sought house arrest for her. But a blood test showed her clear of alcohol and drugs so further analysis was ordered. Ms Zaitseva has declined so far to give testimony on the horrific accident, citing the 63rd article of the Ukrainian constitution, permitting her not to incriminate herself. Separate footage suggests she had been racing another car moments before colliding with a VW Touareg, then spun out of control and overturned, ramming into the pedestrians.